Say goodbye to uneven stubble and unruly facial hair, thanks to the super-smart and high-performance features of the Remington MB4010 Horizon Beard Trimmer. Having been in this business for more than 75 years and having invented the world’s first electric shaver, Remington can be trusted to do a great job with the MB4010 Trimmer, as well. Maintaining well-groomed and well-styled stubble at all times is now a reality. 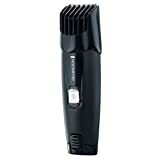 This trimmer offers you the flexibility to choose your length and carry it off with an ultra-cool attitude. Take a look at the features, pros and cons of this trimmer herewith. Yes, it is obvious that the Remington MB4010 Horizon Beard Trimmer has its share of shortcomings. We do not recommend this beard trimmer for the money. There are many better alternatives out there for functional and reliable beard trimmers on the market. We suggest you look at our top 10 best beard trimmers to see much better alternatives than this model. Other overall reviews online only put this trimmer at a 3.7 out of 5, with over 25% 3 star or lower.